This month Asurion is launching “October is Protection Month”, a campaign designed to keep you in the know and up to date on ways to protect the technology you depend on every day. Throughout the month we’ll be launching cool tools like a savings calculator and an online app that will predict how your stuff will die based on your awesome lifestyle. To kick off the month, we’re posting a series of tips and tricks to help you keep your gadgets up and running. This marks the first post in a series of five, so be sure to check back each Wednesday in October for more helpful hints on the gadgets you use most at home. The best kind of kitchen is one that works. All the time. When technology fails, life stops running like the well-oiled machine you worked so hard to build. When the troubled technology is in the kitchen––well, most of us can’t even go there. 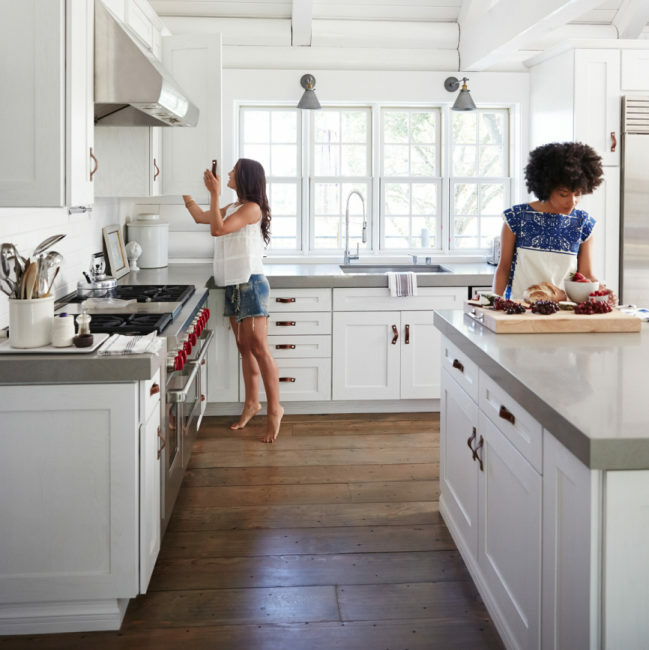 Avoid total chaos in your house by making sure your kitchen essentials are covered against a malfunction or shutdown by getting a protection plan from your retailer, and by following these helpful hints to extend the life of your trusted appliances and keep them performing efficiently, especially heading into the holiday season. Three tips to keep your fridge running. And no, you won’t have to catch it. 1. Twice a year, check the door gasket by closing a dollar bill in the door; if the dollar bill falls out, it’s time to replace the gasket. If the gasket is still keeping all of the cool air where it belongs (inside the fridge), then simply wipe it clean to keep the seal nice and snug. 3. A full fridge is an efficient fridge. Keep it well stocked, and you’ll maintain what’s called “thermal mass,” which helps the refrigerator efficiently maintain its cold temperature (which is ideally between 37 and 40 degrees Fahrenheit). Dishwashers? Keep them clean so they can clean. 1. Remove and clean the spray arms. Ensure there is no food or detergent build-up clogging the holes which could inhibit a thorough clean each cycle. 2. Consult your owner’s manual for instructions on removing the filter basket––the process varies by model––then take it out and give it a good washing with soap and water. 3. Clean the inside of the dishwasher with one cup of distilled white vinegar. Pour the vinegar in the bottom of the dishwasher and run a full cycle (empty, of course) on the hottest temp setting. 4. Check all of the rubber gaskets and water hoses. Make sure the water hoses are tightly secured and there are no holes or signs of deterioration. This is one sure way to avoid leaks. And nobody wants a leak in the kitchen. 1. Run the self-clean cycle once or twice a year, depending on how often you bake. Plan one of those cleanings around a time when you’re using the oven often, and with the holidays around the corner now would be a great time. 2. Replace the oven light and check the gaskets around the door regularly to ensure the oven is sealing in all the heat. This ensures even cook times, controls heat distribution, and can help you save energy. Washing machines need a little love, too. 1. See those rubber hoses that came with your machine? They can break and leak. Replace them with steel braided ones. They last longer and give you something valuable these days: peace of mind. 2. Once a year, take a peek. Look at the hose and hose connections behind your washer to ensure they are tightly fastened, in good condition, and not leaking. 3. Every six months, clean the machine’s soap dispenser with warm (soapy, of course) water, then run the washer for one cycle on the “clean washer” setting. If your washing machine doesn’t have that cycle, just run an empty bleach load with hot water. It’s good for it. To make sure you get the most out of all your kitchen gadgets, protect them with a protection plan from your retailer. Visit www.asurion.com to learn more.